Brrr... it's getting cold outside - Calorimetry time! Yarn: Araucania Nature Wool Multy in 416. This is very yummy yarn! Pattern: Calorimetry (found here), a very easy pattern. 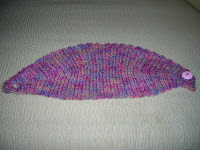 Seriously, it takes about 2 hours to make this headwarmer. Funny little thing. I originally made Ashley's Calorimetry on size 8 needles (5mm). 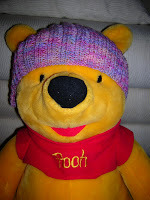 I thought it would be cute to make this with mini cables -- as done on Mum's Calorimetry last year (can be seen here). So I switched to smaller size 6 needles (4mm) and knit about 8 rows with mini cables and realized you cannot see the cables with this yarn. 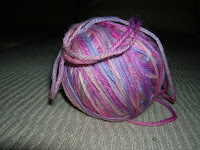 The yarn is beautiful, but it does not allow for cables or other fine details stand out. So switching back to the larger needles and staying with the 2x2 ribbing with this yarn.